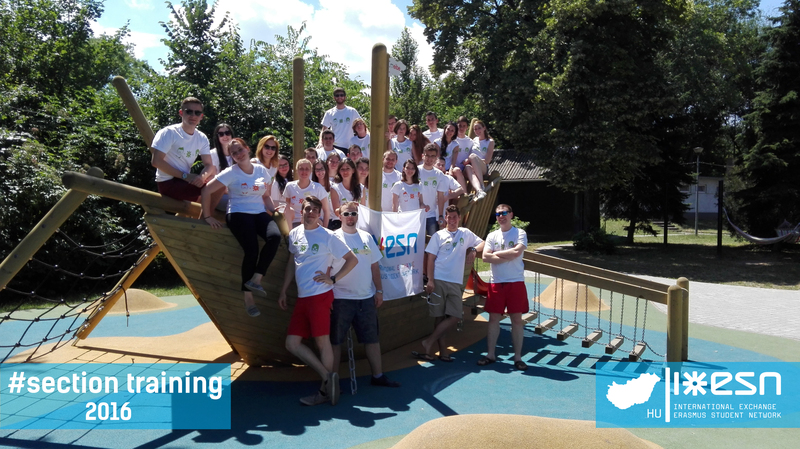 This summer ESN Hungary organized the third edition of its national training event, Section Training 2016, with even more international guests, facilitators, sessions and fun than ever! The event took place in the sunny town of Velence, by Lake Velence, which has Hungary’s second most popular beaches. The lake- side is not only beautiful, but has a great location and campings, so everything was given to have a fantastic weekend there. Around 40 ESNers participated from Hungary and Croatia in total, so we managed to strengthen #BuddyCountryLove with our neighbours. Beside the National Board members and coordinators of ESN Hungary, we had an International trainer from Czech Republic as well, who raised the quality of the event as being one of the most experienced and talented facilitators in the organization. The program included small sessions, workshops, teambuildings and parties, so our members learned a lot about ESN, self- development, leadership, management and teamwork while having fun. This event brought together the newest and most motivated volunteers of our country where participants learned from each other, about their skills and competences, about the added value with wich ESN can contribute to their personal and professional development. It was incredible and successful!